Archaeologists have “discovered” a Stonehenge-like circle in rural Scotland, only to find that farmers and locals have known about it for generations. 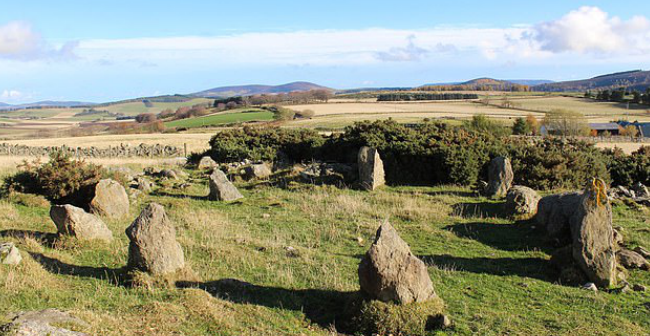 The complete stone circle is near Alford, and was reported by Fiona Bain whose family has farmed the land for years. It is thought that the circle was constructed around 3,500-4,500 years ago and each stone stands about three feet high. Although news to archaeologists, locals have been walking their dogs past the monument for years. One member of a Scottish farming family, now in her 80s, said she remembered seeing the stone circle at some time in the 1930s. However the circle was on farmland and far from main roads, meaning it wasn’t easy to notice. 1. Which of the following about the Stonehenge-like circle is TRUE? A The Stonehenge-like circle was found in urban Scotland. B No one except the archaeologists has known the stone circle ever before. C It’s Fiona Bain’s family who reported the discovery of the stone circle. D Each stone in the stone circle stands about three feet high. 2. What makes the stone circle different from other examples? 3. What can’t we get from the passage? A The locals are familiar with the stone circle. B The stone circle are far from the main roads. C The stone circle is one of the last complete examples. D The whole northeastern part of Scotland has already been well-surveyed. 4. What’s the meaning of this new discovery according to the last paragraph? A It will help people understand northeast Scotland’s history and geography. B It will be able to make northeast Scotland much more fantastic. C It will add much attraction to the record of those known sites. D It will let more and more fantastic monuments be found.